Technology and scientific advancements in the world of paleontology have made the field that inspired the character of Indiana Jones and fueled Spielberg's other box office smash series Jurassic Park more productive than ever. Needless to say, without the aid of a time machine, we may never be able to answer just what dinosaurs actually sounded like (despite the frightening roars provided by Hollywood) nor what color they were precisely. However, in the fascinating analysis served up in this visually thrilling and informative IMAX documentary narrated by Michael Douglas that's now been transferred to disc with education in mind, we realize that paleontologists have learned enough to go back and correct mistakes in earlier assumptions. In this regard, we're informed that even certain dinosaurs that didn't fly had a distinct body comprised of feathers as opposed to reptilian features along with the fact that instead of a full extinction, we're now quite certain that one breed transformed into the very birds that still soar through our skies today. Furthermore, the issue of climate change and the major role it's had in not just sustaining or ending life but preserving fossils as well is addressed even if at a more understated level that's emphasized with visualization rather than explanation. This occurs when we move away from the areas of China and Russia to ascertain that millions upon millions of years ago the landscape of New Mexico's Ghost Ranch was comprised of lush wetlands, evergreen trees, and rich soil instead of today's dry, beige deserts. And because of these new factors in the geographic location, it's the flash flooding in the area which drowned the dino inhabitants fully and ensured that the water and sand mixture managed to keep them intact, thereby making New Mexico such a hotbed of activity in archaeological discovery. The work directed by Bayley Silleck and David Clark originally in 2 and 3-D for the IMAX format combines live action cinematography, still photography, computer generated animation, and other techniques to ensure that we don't get lost in the copious amount of data being truncated into its 40 minute running time. 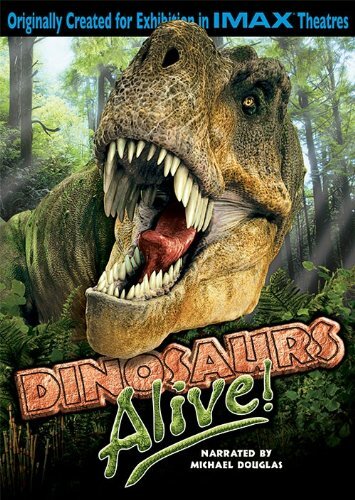 The 2007 film, titled Dinosaurs Alive! transfers quite superbly to the Blu-ray high definition set-up with 5.1 DTS Master Audio on every track in its 1.78: 1 (16x9) widescreen aspect ratio along with Spanish and French soundtracks as well. Although nothing can substitute IMAX, the cinematic recreation is also enhanced by extras that maximize the format including an HD filmed 27 minute making-of feaurette “Meet the Creatures” and a quiz section that reiterates comprehension with its natural educational intent from a filmmaking standpoint. The entertaining documentary begins with a focus on the expeditions today wherein we watch in awe as the paleontologists uncover a dinosaur who would've been 110 feet long and 30 tons in weight (or the equivalent of 8 elephants). Proving how vital it is to continuously check the facts since it is after all the history of our planet-- and in turn ourselves-- that we're studying, a mistake is later corrected regarding one group we'd previously assumed to be dinosaurs that are in actuality a different species which possess two legs and walk entirely upright. Going back in time to not just recreations of the dinosaurs themselves but the history of those who've studied them, the film champions the tireless efforts of men and women who've been pursuing these fossils and analyzing data since the famed 1920s Natural Museum of History sponsored digs in the Gobi Desert up through current day. And despite its short running time, it's a solid film that includes scientific first-hand accounts along with visualizations to better assist in our understanding. Likewise, it will no doubt inspire more interest in the topic from viewers when narrator Douglas shares that despite all of our progress, we've only uncovered a mere 2% of all dinosaurs who once roamed the Earth. It's a deeply humbling statistic and moreover sure to remind us once again just how much about our planet we don't know and how vital it is that we continue to research this subject. For, since history is never content to stay in the past, the more we learn the better off we'll be in understanding more about our existence and beginnings here on Earth as well as what could be next in the evolutionary timeline. Yet then again, that's probably a topic for a whole different IMAX special in the future.